Wise Solution Review 2019: Is Wise Solution a Good Hosting? Wise Solution is a web hosting provider offering Linux shared hosting, reseller hosting, VPS hosting, and dedicated servers. Their web hosting packages are amazingly cheap, which is likely why they’re the fastest-growing web hosting company in Jaipur, Northern India. Headquartered in Jaipur, India, Wise Solution is an Indian web hosting provider offering Linux shared hosting, reseller hosting, VPS hosting, and dedicated servers. Their web hosting packages are amazingly cheap, which is likely why they’re the fastest-growing web hosting company in Jaipur. They currently serve over 6000 customers from over 130 countries around the world. Their website is available in English. All packages also include access to the RVsitebuilder tool, which will definitely help you get a professional-looking website up and running quickly. At the other end of the spectrum is the Diamond Plan. This offers you unlimited disk space, bandwidth, add-on domains, subdomains, and email accounts. But if this sounds like a dream come true, bear in mind that they do have a little word of caution in fine print: the unlimited storage is solely for your website and must be used according to their Terms & Conditions. Furthermore, they don’t allow any hosting account to take up more than 5% of the shared server’s CPU, which means you may find your hosting account suspended if you’re not careful about the limits. There aren’t any uptime guarantees for their shared hosting service, but they do have a 99.99% uptime guarantee for their VPS hosting. This doesn’t extend to their dedicated server packages, unfortunately. At first glance, Wise Solution’s hosting packages are inexpensively priced – the yearly cost of their Copper plan is less than the price of a cup of coffee. But this is actually pretty misleading, given the number of add-ons you may have to purchase along the way. For instance, none of their shared hosting plans include a free domain: in some cases, the cost of registering a domain can be several times more than the price of the hosting package. Also, there are no SSL certificates included; you’ll have to purchase this separately. This means that overall, you may be paying much more for this host than if you’d chosen an alternative all-inclusive package. There are no free versions of their plans, nor does there appear to be a money back guarantee for their shared hosting. Interestingly enough, they do offer a seven-day money back guarantee for their Linux VPS plans though. Wise Solution offers 24/7 support via email, live chat, or support tickets. They also have a mobile phone number you can call during business hours from Monday to Friday. My experience with their customer support wasn’t great, to be honest; not only did they take over two days to respond to my ticket, but they were very abrupt in their communication. Furthermore, there was no response when I contacted them about the servers being down. Unfortunately, my overall impression of their support was subpar. Wise Solution is an acceptable entry-level host for beginners, but their pricing schemes and customer support leave much to be desired. 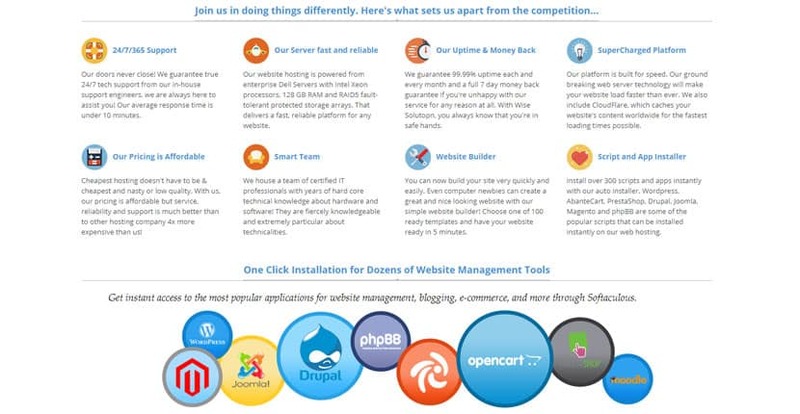 Wondering how Wise Solution stacks up against other Web Hosting companies? Enter any other Web Hosting company and we will give you a side-by-side comparison.